Namespaces and autoloading are not topics that are usually discussed when it comes to working with WordPress plugins. Some of this has to do with the community that's around it, some of this has to do with the versions of PHP that WordPress supports, and some of it simply has to do with the fact that not many people are talking about it. And that's okay, to an extent. Once you've got all of that in place, let's get started on building a plugin. Note that if any of the above seems new to you, then don't hesitate to review any of my previous tutorials on my profile page. Furthermore, you can follow me on my blog and/or Twitter at @tommcfarlin where I talk about software development in the context of WordPress. 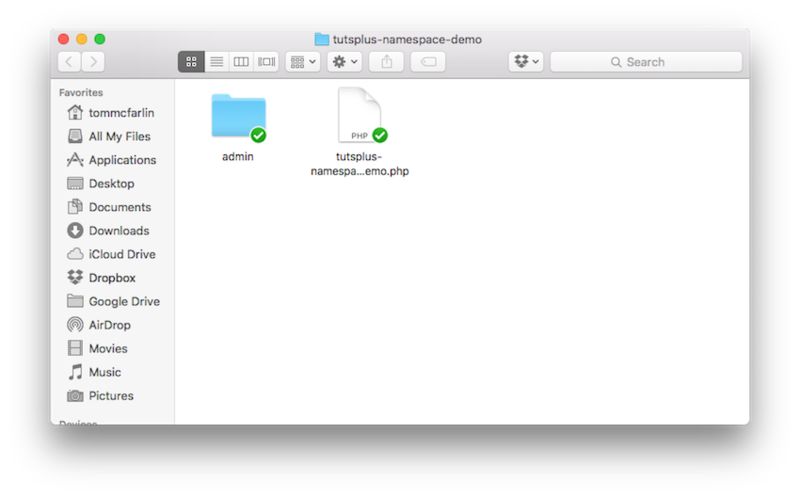 In this series, we're going to be building a simple plugin primarily to demonstrate how namespaces and autoloading work in PHP. But to do that, it always helps to apply the concepts in a practical way. 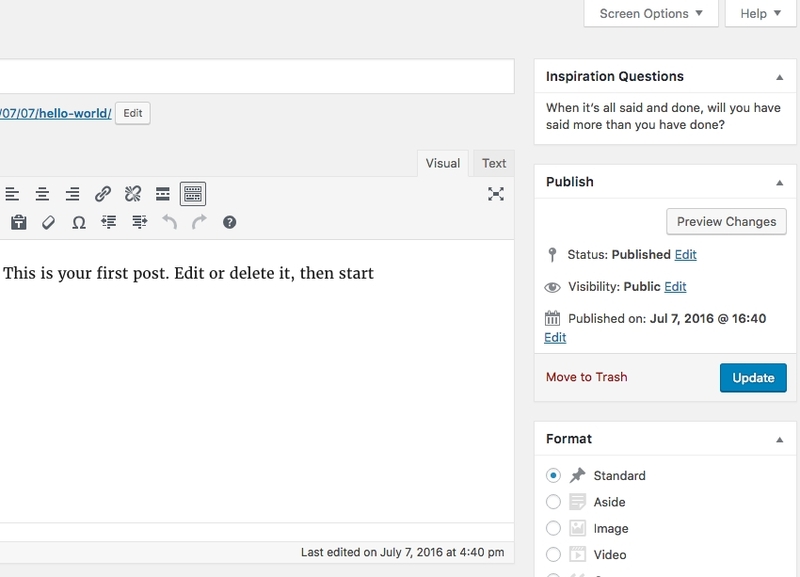 No, this isn't something that you'd likely submit to the WordPress Plugin Repository, nor is it something that you'll likely use outside of this particular demo. But remember, the purpose of this series is to demonstrate how namespaces and autoloading work. And it's through this example that we're going to do just that. Define a bootstrap file for starting the plugin. Set up a directory for all of the files that will render the meta box. Create a directory for housing the class that will load our dependencies. It seems straightforward, right? If not, no worries. I'm going to walk you through the entire process complete with code, comments, screenshots, and explanations. From the outset, we know that we're going to need a file that serves as the bootstrap for the plugin. We also know that we're going to need a directory for the administrative functionality. Obviously, we have a single empty file and an admin directory. Let's go ahead and set up this plugin so that it shows up within the context of the WordPress Plugin activation screen. Then, when you navigate to the WordPress Plugin Page in the administration area, you should see it show up in your list of plugins. If you opt to activate it, nothing will happen since we haven't written any code. At this point, we can go ahead and begin defining the class that will render our meta box on the Add New Post page. This part of the tutorial will assume that you're somewhat versed in creating meta boxes. If not, don't hesitate to review the concepts in this series and then return to this part once done. 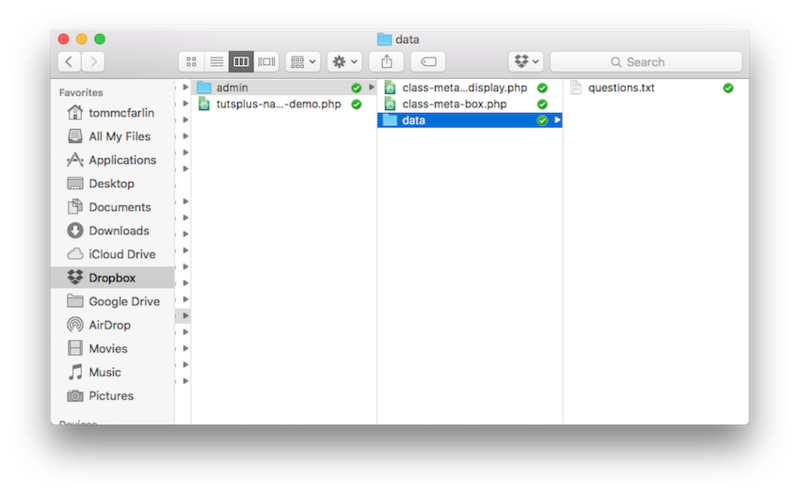 First, let's create a file called class-meta-box-display.php in the admin directory of our plugin. The code should include the following. Be sure to review the comments to make sure you understand everything that this class is responsible for doing. * or the file it includes to render within the meta box. From the code above, you should be able to ascertain that this class will be responsible for displaying the content inside the meta box. For now, however, we simply have it echoing a statement for the view. We'll change this later in the tutorial. * displaying whatever content is rendered within the display. * A reference to the Meta Box Display. * @param Meta_Box_Display $display Displays the contents of this meta box. This class maintains a single attribute which is a reference to its display. This means that this class is responsible for defining the meta box (which, in turn, calls on the display object to render the message). The display is maintained as a private property set in the constructor. The meta box isn't actually defined until the init method is called (which we'll see in the plugin's bootstrap later in the tutorial). At this point, we have everything we need to display a rudimentary meta box on the Add New Post Page. But first, we need to set up our plugin's bootstrap. In previous tutorials, I've done this a lot so I'm going to include just the code that's required (since I've defined the header above). I've added comments, but I'll also make sure to explain what's happening after the code. This is specifically relevant because our autoloader will eventually negate the need for some of what you're going to see. First, we make sure that this file can't be accessed directly and it can only be run by WordPress itself. Next, we include_once the classes we've created thus far. Next, we instantiate the Meta_Box and pass it an instance of the Meta_Box_Display in its constructor. Finally, we call the init method that resides in the Meta_Box class. Assuming all goes well, we should be able to activate the plugin and see the meta box on an Add New Post page (or, really, an Update Post page, as well). At this point, we have a functioning plugin, but it doesn't really do anything other than create a meta box and display a string of text. Let's at least get it to display some inspirational quotes and display a random one each time the page is loaded. First, we need to find a text file of inspiration quotes. Luckily, the Internet provides a plethora of these that we can use in our project (and they are freely available). To that end, I've created a data subdirectory in admin that I'm using to house my questions.txt file. Read a random line into a string. Return the string to the caller. Let's go ahead and create that class now. Because this is a utility and it's going to be used in the administrative side of the plugin, let's create a util subdirectory in admin. Next, let's create a file called class-question-reader.php. As you can see, the number of files we're having to manually include is getting longer. Imagine if we were working on a large plugin! Nevertheless, we'll come back to this later in the series. * that prompt the user for ideas about which to write. * assumes the specified file always exists. * Retrieves a question from the specified file. * @param  string $filename  The path to the file that contains the question. * @return string $question A single question from the specified file. * Opens the file for reading and returns the resource to the file. * @return resource          A resource to the file. * Closes the file that was read. * @param  string $file_handle The resource to the file that was read. * @param  string $filename    The path to the file containing the question. * @return string $question    The question to display in the meta box. // Look for a question until an empty string is no longer returned. We're opening the file using fopen, which will grant us a resource to read the file. Next, we're reading the contents of the file and then taking each line of the file and writing it to an index of an array. After that, we pick a random number from the array of questions and return it to the method that's calling it. If it returns an empty string, we look again until a question is located. Then, we close the resource to the file. Ultimately, to use this class, you simply need to instantiate it, know the path to a file full of questions, and then call the get_question_from_file method. Note: This class does not do any error handling. That's a standard practice when working with files. For example, what should we do if the file doesn't exist? What should we do if it's not formatted correctly, or what if we fail to close the resource? All of these are good questions, but they are outside the scope of this tutorial. All of this information can be found in the PHP manual (and perhaps some other tutorials across the Envato Tuts+ network). For now, though, we're concerned with reading a file that we know exists, and we're concerned with displaying the results in a meta box. At this point, we can begin putting everything together. 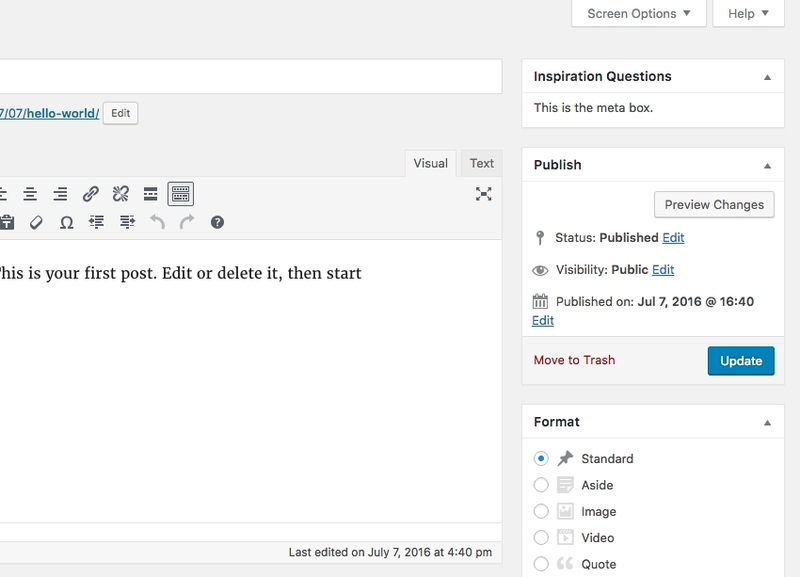 Assuming we've done everything correctly, we should be able to pass an instance of the Question_Reader to the Meta_Box_Display, ask for a question, and then display it in the meta box. * A reference to the object responsible for retrieving a question to display. * Initializes the class by setting the question reader property. * @param Question_Reader $question_reader The object for retrieving a question. Notice that this file uses the path to the questions that file added to the data subdirectory. Aside from the path being hard-coded, this class is also dependent on an instance of the Question_Reader. For the purposes of the demo that we're working toward (namely, namespaces and autoloading), that's okay. In a future project, we'd like the projects to have less coupling among themselves. Perhaps this will be a topic for a future tutorial. The primary takeaway from the code above, though, is that the Meta_Box_Display class can now display a question to the user. Furthermore, notice the use of wp_kses for the sake of sanitizing the data before presenting it to the user. And if you refresh the page then you can see new questions being loaded. Obviously, we've yet to actually tackle the topics of namespaces and autoloading, but that's okay! It's important that we lay the foundation for a plugin that doesn't use them. That way, when we do implement them, we can see the benefits they carry. Remember, you can find all of my previous tutorials on my profile page, and you can follow me on my blog or on Twitter. With that said, we'll have a working version of the plugin ready to download starting in the next tutorial in this series. If you'd like to use the code in the above tutorial, don't hesitate to try and do so. Furthermore, feel free to ask any questions in the comments.